Our shutters come in a range of different styles that will blend into your architecture, highlight your windows and provide the versatility to invite the light in to suit your mood or block it out completely when privacy is required. With interior shutters you can adjust the light manually or automatically with our revolutionary remote control options. Bella Blinds 'wooden shutters' look equally beautiful from inside and outside in contrast to the drab look of curtain linings. All of the shutter we install are made-to-measure shutters and blinds increase the intrinsic value of your house and they’re long lasting. Shutters are easy to use and easy to clean. If you suffer from dust allergies, you’ll love them too. With the UK’s largest range of shutter frames, colours, louvre sizes, paint and stain finishes the choice is yours. Whether you decide to choose our Café style, Tier-on-tier, Full height or Tracked shutters, Bella Blind's made-to-measure solutions enable you to choose the right style for your individual requirements. 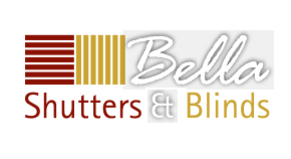 Here at Bella Blinds we are able to offer a range of shutter styles that blend into your lifestyle. They enhance your rooms and can be adapted to suit your lighting moods from full natural light to complete darkness when you need your own privacy. You can adjust your interior or shutters manually or have one of our remote control solutions installed so you down have to strain to adjust those hard to reach windows. Our window shutters look great both from the inside and out, for a quick insight into what our shutters look like please visit our window shutters gallery. All of the shutters we fit are mad to measure, ensuring they fit your home perfectly. We offer 6 materials to choose from, each one offering its own benefits. Depending on your budget and specifications we can help you choose the one best suited to your needs. In the true nature of our bespoke window covering solutions we offer a vast array of finishing options to ensure your made-to-measure shutters and blinds blend in to their surroundings perfectly. Options are broken down into standard and custom finishes and optional extras. There are 6 materials to choose from, each one offering its own benefits. Depending on your budget and specifications your local S:CRAFT stockist can help you choose the one best suited to your needs. We offer our customers a range of stunning plantation shutters that are made from high quality materials that are both affordable and competitive. Our plantation shutters are extremely popular with customers who value refined and sophisticated wooden shutter interior. It is our mission to provide our customers with the most revolutionary wooden shutters on the market, which is why we supply a wide range of plantation shutters to fit your home. If you want to highlight your wooden shutters interior then you should consider purchasing painted shutters. Painted shutters can be customised to match the interior colour of your home, so can beautifully complement your interior design. Painted shutters allow your plantation shutters to stand out and can make your home appear rich and luxurious. Painted shutters can be applied in modern housing or traditional cottages, we apply six coats of paints on your painted shutters using our proprietary paint system. Therefore our painted shutters are less inclined to fade and discolour. While we may supply wooden shutters for the more traditional fittings such as window bays, we also supply a wide range of shaped shutters to fit the most unusual window frame shapes. We can cater for a range of window shapes, such as radius, arched or angled windows. However, we only supply wooden shutters for you wooden shutters interior as we have to customise our shaped shutters for your window frame. Our shaped shutters can offer you complete privacy, as they can block out all light that enters a room as shaped shutters can stop a sunburst from entering above your traditional style windows. Wooden shutters can create an interior look that is refined, contemporary and lavish. There are numerous plantation shutters available from our extensive collections which can be made to measure and come in a wide variety of finishes. There are numerous wooden shutter collections that come in various styles and designs. Whether you require wooden shutters for a bay window, full height window, patio doors or tier on tier windows, we have the best styles for your wooden shutters interior shape. Our mission is to provide a valuable customer service that is reliable and trustworthy. When you purchase wooden shutters for your interior, you will be provided with a three year guarantee, which are published under our specifications. We double pack your wooden shutters for extra security, and these will be safely delivered to your address promptly and without hassle.